"THE INN SIGN SOCIETY NEEDS YOU"
Dear Viewer, As you are looking at this page and our website in general, you probably already have some interest in Inn and Pub signs. PLEASE consider becoming a member of the Inn Sign Society. We need new members to help us capture for posterity in our archives the content of what was previously described as 'free to view street art' depicting such great variety. Sign changes with modern takes on old subjects add to the overall interest, and are noted in our Journal. Write your own article! So click on the 'Join us' page, read the FAQs, and start filling in the downloadable membership form. We shall be pleased to have you as a member! James VI of Scotland inherited the throne of England, as the great grand-son of Mary Tudor, and legitimate heir of Elizabeth I, who had died childless in 1603. In order to reinforce his authority to rule, James I of England decreed that all public buildings (including taverns) must display in prominent places, a heraldic red lion. In earlier times, the crest of the red lion was the badge of John of Gaunt, Duke of Lancaster and the fourth son of Edward III. Gaunt was a corruption of the Belgian town of Ghent, where he was born. 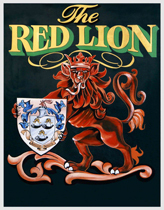 It is estimated there are over 500 pubs named the Red Lion. A sign of loyalty to the reigning monarch. 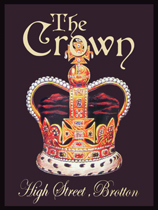 The sign of the crown has been used as an inn sign for hundreds of years as it was easily identifiable for the majority of the population, most of whom were illiterate. After suffering defeat at the Battle of Worcester in 1651, Charles II fled to France via an extremely circuitous route to the sea at Shoreham, Sussex. The name referred to a tree at Boscobel, Shropshire, where the king hid in an oak tree to evade his would-be captors of Cromwell's army. 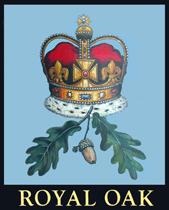 Thereafter, houses or places that provided secure shelter for Charles II during his escape were renamed the Royal Oak. Judging by the popularity of the name, the Stuart king must have tested his supporters' hospitality to the limit. This was the heraldic symbol of Richard II, who came to the throne as a nine year-old boy in 1377. 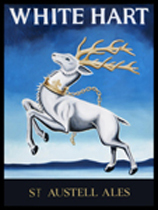 Often, the white hart (a male deer or stag) is portrayed with a golden chain or collar around his neck. 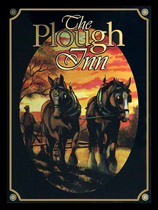 Another image that lends itself well to illustration on inn signs. In ancient times, it was a symbol of innocence, and much favoured by Edward III and Henry VIII. 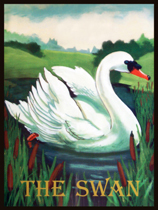 The White Swan is a common variation. The growth of the railway network across the country spawned a large number of railway signs. Despite the axe of Dr Beeching in the 1960s, many such pub names survive, even if the previously adjoining railway tracks do not. Another common sign is of course The Station, and is another main pub name. The variety of railway signs is another absorbing subject, with many scenes depicting both the locos and the roles of people who worked on the railways. The sign may show the agricultural implement that was essential to turn over the soil in preparation for the new year's sowings. Another interpretation refers to the constellation of Ursa Major, and the implement represented by stars only. Very occasionally both are depicted! The name refers to the standard of the Saxons, was adopted by the kings of Wessex and is the traditional emblem of Kent. 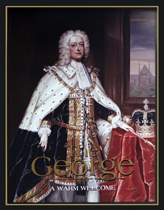 A galloping white horse refers specifically to the House of Hanover - see the entry for George above - and dates from the accession of George I in 1714. 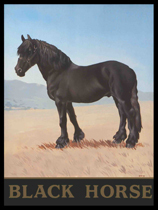 It is somewhat strange that whereas there are numerous pub signs named simply The Dog, The Bull or The Swan, the sign of the horse is invariably qualified by a colour, usually black or white. Hardly inspirational, but when a new public house was built, it was often given this name to differentiate it from an older inn. 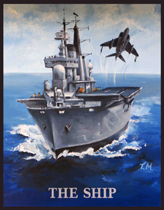 The name has proved something of a challenge to sign artists, as it is not an easy subject to depict. A multitude of different types of sailing vessel to be found in many seaside locations, but occasionally inland, reflecting the nation’s very long maritime history. Heraldry, an enormous subject in its own right, played a great part in the nation's history and each monarch had his favourite emblems which constituted their 'Arms'. Animals, real and mythical, were involved in various forms and postures, usually incorporating a shield with colours red, white, blue and gold. Each of the six King Georges is to be found on a pub sign somewhere. 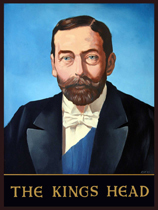 The Hanoverian Georges I to IV tend to be more common than those of the house of Windsor (George V and George VI). The name is a reminder of the close association that the church had with the inns of yesteryear. Many religious establishments brewed church ales which were sold to boost funds. The bell, or the sound of it, was heard far and wide. Often as not, the pub was located in close proximity, and both could be said to provide sustenance in times of spiritual need. The sign usually shows a rose, half red, half white, surmounted by a crown, which became the badge of the Tudors. 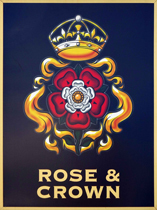 The emblem dates from the end of the War of the Roses (1485), when the victorious Duke of Lancaster (the county of the Red Rose) married Elizabeth of York (the county of the White Rose), thereby uniting the two houses and bringing the war to a close. 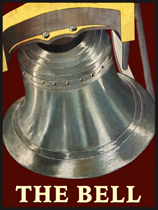 Prior to Henry VIII's breakaway from the Church of Rome, many inns were named the Popes Head. In order not to irk the king, astute innkeepers ensured they had their signs repainted in homage to the king instead. 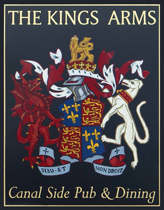 The variety of monarchs portrayed on pub signs provides rich pickings for a speciality subject. 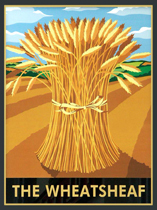 Mainly found in rural areas depicting the nation’s history of arable farming and the local community dependence on produce following harvest. 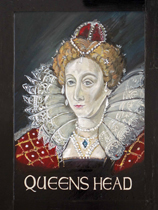 Most signs portray the images of Elizabeth I or Queen Victoria, though most other queens are to be found in isolated cases. 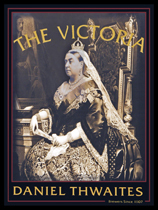 Queen Victoria was our longest reigning monarch until Elizabeth II recently broke her record! 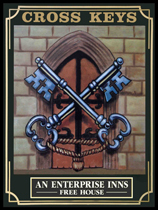 Protocol dictates that reigning monarchs are not to be portrayed on inn signs during their lifetime - however, occasional instances do occur. 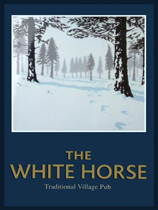 Numerous pub signs are named simply The Dog, The Bull or The Swan, however the sign of the horse is invariably qualified by a colour, usually black or white. Originally a religious symbol that depicted the star of Bethlehem or that of the Virgin Mary, one of whose titles is Star of the Sea - Stella Maris. 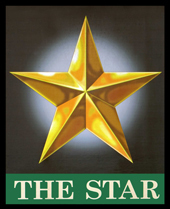 In recent times, the star had heraldic significance as in the Star and Garter. It also often simply refers to a star in the sky such as the North Star or the Pole Star. Related to Christian heraldry, this refers to Saint Peter being given he keys of the kingdom of heaven. Often appears on signs close to churches indicating that the original pub building was closely associated. Before the advent of the railways, the recognised, and often perilous, method of transport was by stagecoach. 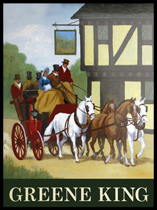 Inns along the route provided refreshment, overnight accommodation and fresh horses. 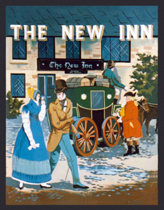 Inns often took the name where coaches stopped. Such places are often recognisable today by covered archways leading to a rear courtyard and stables. The similarly-named Waggon & Horses indicated that freight might be forwarded or received at the pub. Another reminder of the religious connection between pint and pulpit. 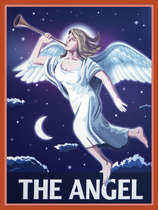 The name is thought to have represented the Archangel or St Michael, who was the patron saint of the Knights Templar. They would adorn a tavern with such a painting, not to name it, but to show that it was under God's protection. 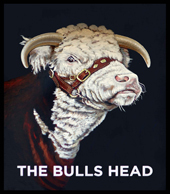 The bull has always been a popular and readily recognisable symbol as a working animal. It is linked with drovers’ roads indicating places for them to stop the night with their herds. Some pubs with bull in their name also stem from a religious source because bull also comes from latin 'bulla', an ecclesiastical seal used by papist Rome, which Henry VIII took for his own use. The sign also features in heraldry, particularly in that of the Butchers Arms, which refers to the Butchers Company granted arms in 1540.